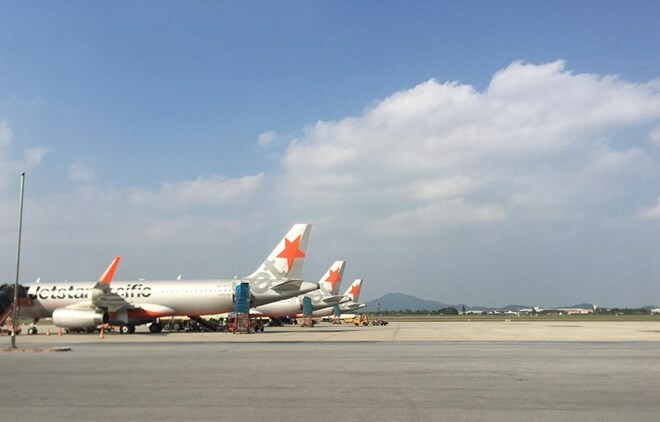 Hanoi (VNA) - Low-cost carrier Jetstar Pacific officially announced three new domestic routes connecting the central city of Da Nang with Vinh, Thanh Hoa and Phu Quoc Island on April 9. The airline said tickets would be available from April 10 with a starting price of 190,000 VND (8.4 USD) for one way flights. The airline will start flying from Da Nang to Phu Quoc from May 24 with four flights per week, and one-way tickets will be priced at 890,000 VND (39.4 USD). The Da Nang-Thanh Hoa route will offer one way ticket prices of 370,000 VND (16.4 USD) with four flights a week from May 25. Da Nang International Airport is the country's third largest airport after Hanoi and HCM City. Jetstar Pacific said it was offering a promotional price for the three new routes of 33,000 VND (1.5 USD) on its website www.jetstar.com from 11am on April 15-17. In 2018, Jetstar Pacific carried 6.2 million passengers, a 14.3 percent increase year-on-year. Jetstar Pacific, a member of the Jetstar Group, has grown from five aircraft in 2013 to 17 and now flies 32 domestic and international routes.